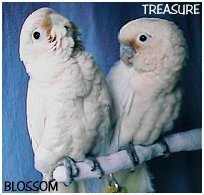 Blossom is a DNA sexed female Goffin's Cockatoo. She was hatched on 3/29/98 and came to live with me at the end of October '98. It was a classic case of love at first sight for both of us! Goffin's are my favorite of all the parrot species. I've always found their appearance and personality very appealing. They look like they're made of cotton candy, puffy clouds, and marshmallows all spun together into a soft, sweet little package! Their coloring of white with touches of pastel yellow, peach and blue, reminds me of a delicate flower. This image can be misleading though, as these birds can be tough little characters. 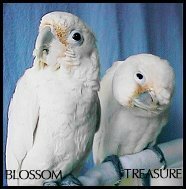 Blossom's and Treasure's personalities are typical of the Goffin's. They can be stubborn, bratty, cuddly, silly, cute, demanding or sweet... all depending on their mood, and their mood can change without warning! Sometimes they're happy to be out of their cage on their playgym, entertaining themselves with their toys. Other times they're content just snuggling up with me for lots of petting. And then there are times when they're being little brats and they can't make up their mind WHAT they want to do! Those are times that can be the most frustrating, but it's all part of the Goffin's nature and what makes this species so lovable and unique. I wouldn't change a thing about either of them. 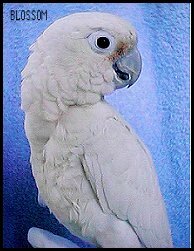 The Goffin's cockatoo ranks among the smallest of the cockatoo species, its over-all length being about 13 inches. 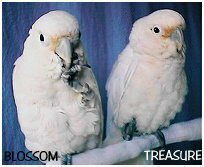 These little beauties are a favorite among cockatoo owners, and it's easy to see why. For one thing, their small size makes them ideal for those who want all the cockatoo traits, but in a smaller package than the Umbrellas or Moluccans... and with a lot less volume in the screaming department. Goffin's, like all cockatoos, are cuddly and sweet. However, they do seem a bit more independent, ornery and downright stubborn than their larger cousins. They're intelligent, demanding, playful and curious... which can get them into trouble if they're not closely supervised! Some individuals can learn to talk, and even sing, quite well. Others may never talk. I had a Goffin's that sang and talked up a storm. Another one I had never said a word her whole life. If you're looking for a parrot known for good talking abilities a Goffin's probably isn't the right bird for you. If you want a beautiful parrot that will give you a lifetime of unconditional love and pleasure, I suggest you consider a Goffin's. TREASURE is a DNA sexed male Goffin's and is the baby of the family. He hatched on March 7, 1999 and was given to me when he was just 3 weeks old. These photos were taken when he was 14 weeks old. (He's on the right.) It was a great pleasure hand rearing him to the beautiful bird he has become. His personality is very much like Blossom's, except that he's perhaps a little more timid. He's also a little more vocal and I suspect he just might learn to talk. This little guy is a "Treasure" in the most literal sense of the word. I am so very fortunate to have been given such a precious gift to enrich my life.